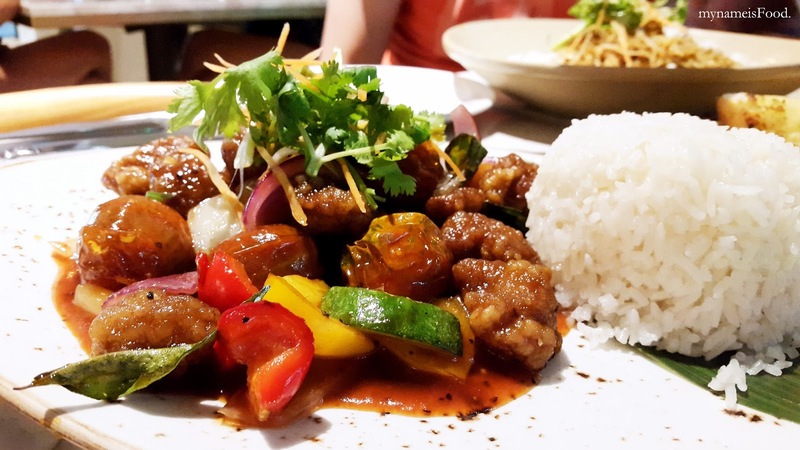 Jimmy's on the Mall, Queen Sreet Mall, Brisbane CBD - my name is Food. 'Caramelized Crispy Pork Spare Ribs' ($17) is literally what the name of the dish is but being twice cooked pork ribs and sticky black pepper sauce. There were about four to five pork ribs pieces, caramelized well being sticky and sweet at the same time. 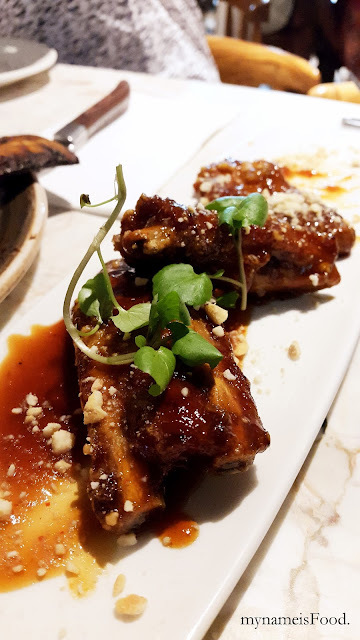 The crushed peanuts on top of the ribs was a nice touch, giving it a crunchy texture and balances out abit of the sweetness of the caramelization. The black pepper wasn't as strong but was more on the sweet side of the flavour. 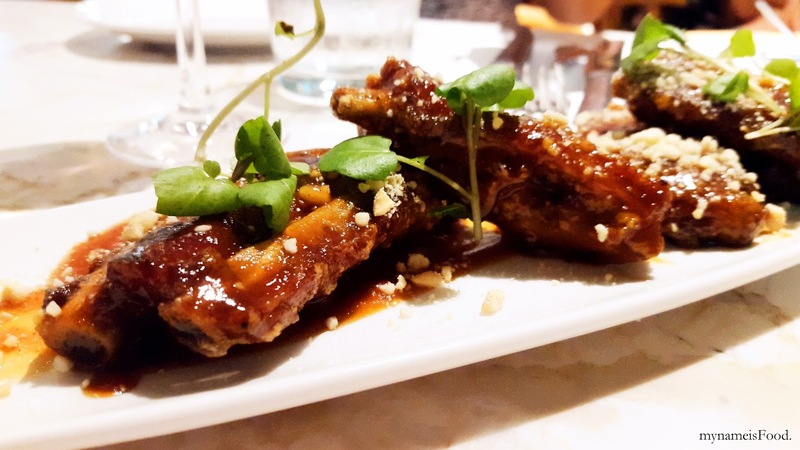 This dish would be great with a drink or two nibbling on sticky ribs. 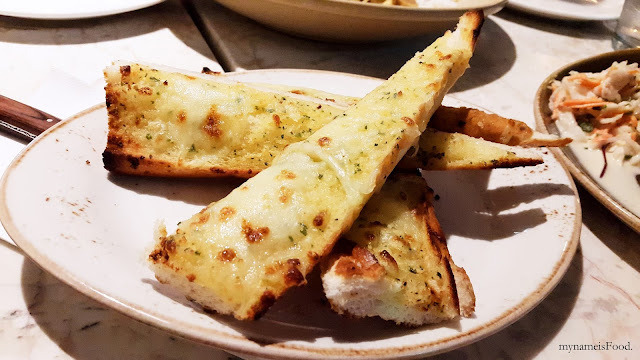 'Cheesy Garlic Bread' ($8) consisted of four long baguette slices topped with grilled cheese and confit garlis as well as some herbs. 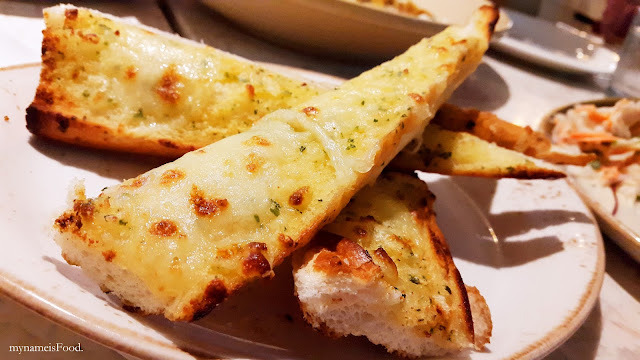 Sometimes when ordering garlic bread or cheesy garlic bread, you could easily just get garlic butter spreaded out on a piece of toast. So, it was really nice having a baguette as the base. 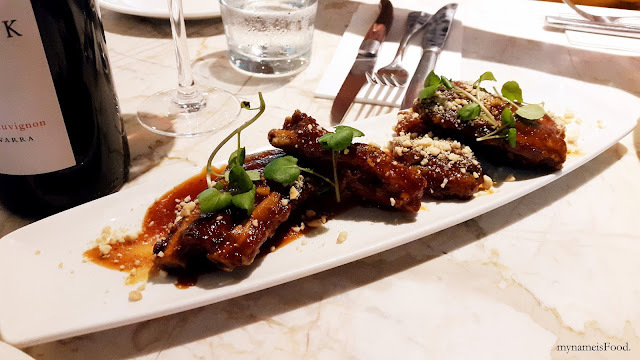 However, the cheesiness could have been more than it was but you are able to taste the confit garlic as you take every bite. 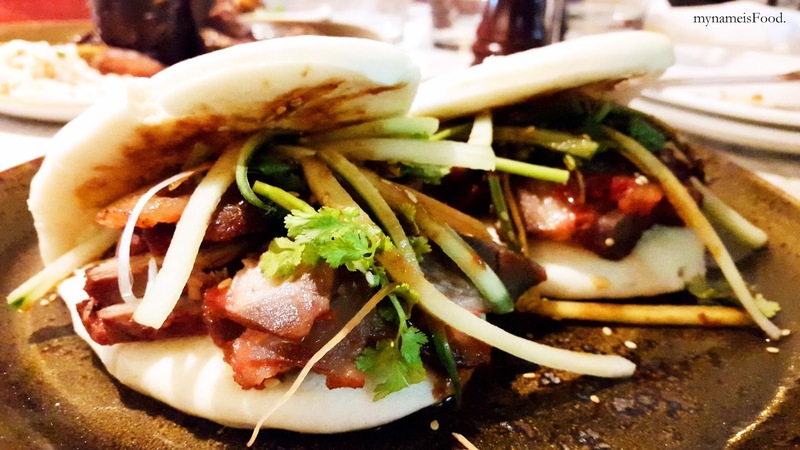 You are also able to see the burnt bits which I feel is great, showing the grilled and smoky flavour and texture. The scotch fillet was moist and soft as the batter was slightly crispy, balancing well with the rice. 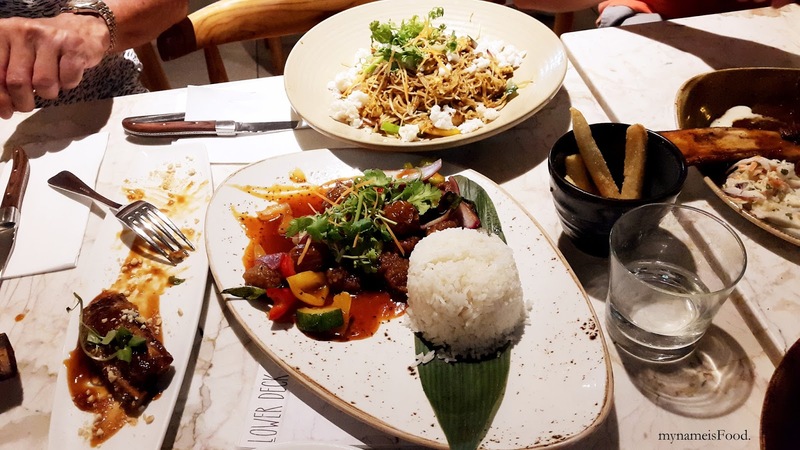 However, it didn't seem to be Hainan rice however, just plain rice or maybe the rice just had a very light subtle Hainan flavour in it. 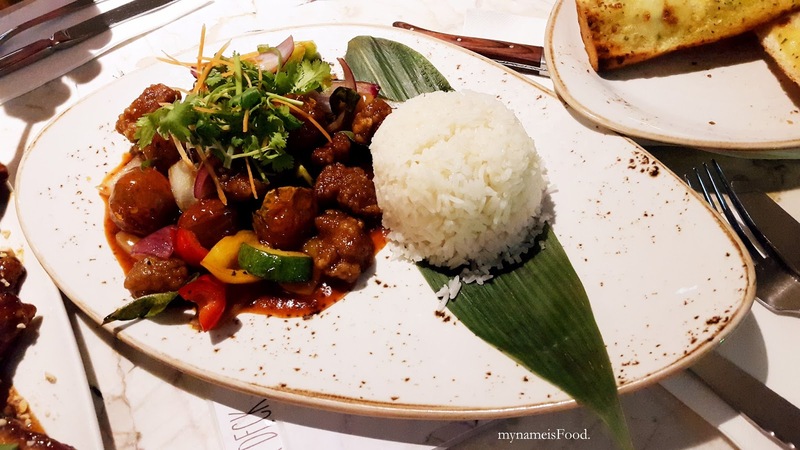 The sauce was sweet but not too sour and by mixing it with the rice, it allowed to have a nice balance between the pork, sauce and rice. The vegetables seemed to have been pickled but am unsure of that, as it did have a hint of sourness within. 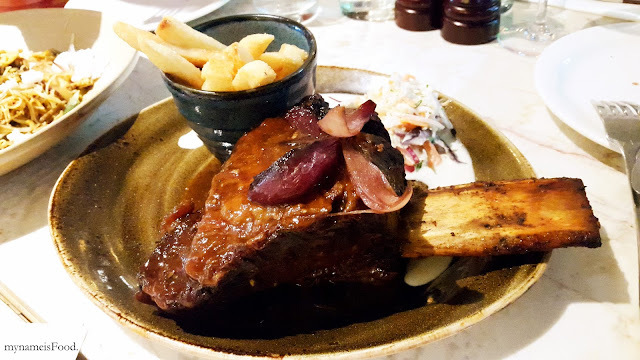 I am actually unsure what this was called.. but if I am right, 'Slow Cooked Meaty Beef Short Ribs' ($36) which includes coleslaw, fat chips and smokey whisky BBQ sauce with crispy onions. This dish contained one big fat rib which wasn't what I was expecting but I loved seeing the bone having those burnt marks. It totally gave this dish a smoky but also a very rough feel. 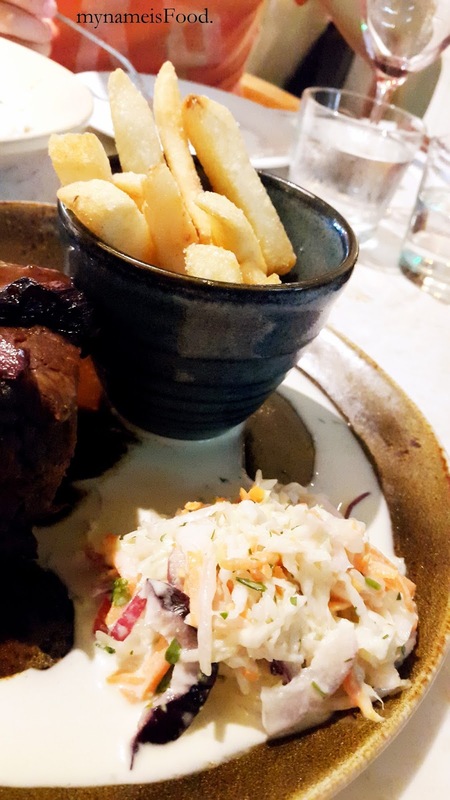 One downside was the coleslaw's sauce would drool all over the plate, making the bottom of the rib have a bit of soggyness and also a taste of mayo. The fat chips was just chips but was fried well. 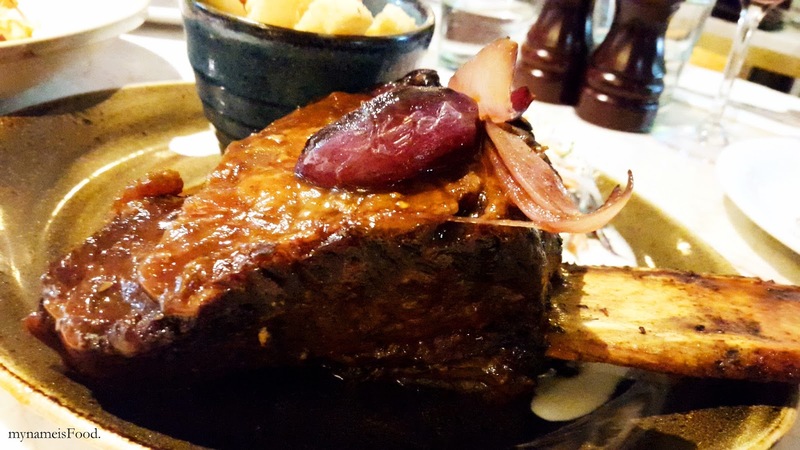 The ribs was quite tender but still had some unbalanced parts being quite hard and rough. Overall, the meat has been cooked alright having the strong BBQ sauce base. 'Singapore Crab and Prawn Noodles' ($32) is a dish I didn't expect to be here but was, placed with the other Asian dishes offered, this intrigued me as Singapore noodles were tweaked in having crab and prawn as the main meat of the dish. 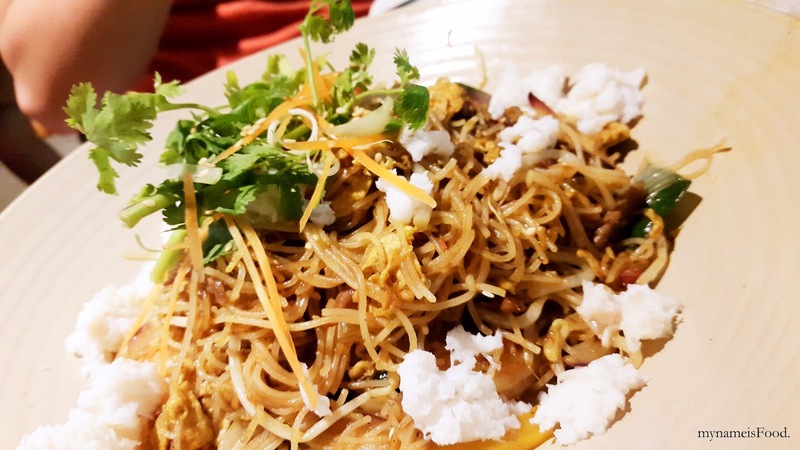 Thin noodles tossed with spices, egg, sprouts and char siu pork as well as prawn. Overall, the dish was quite bland other than it had a soy sauce base but the crab meat and everything blent in well. Noosa spanner crab is used and as you can see from the pictures, it is quite interesting how they have presented this dish. 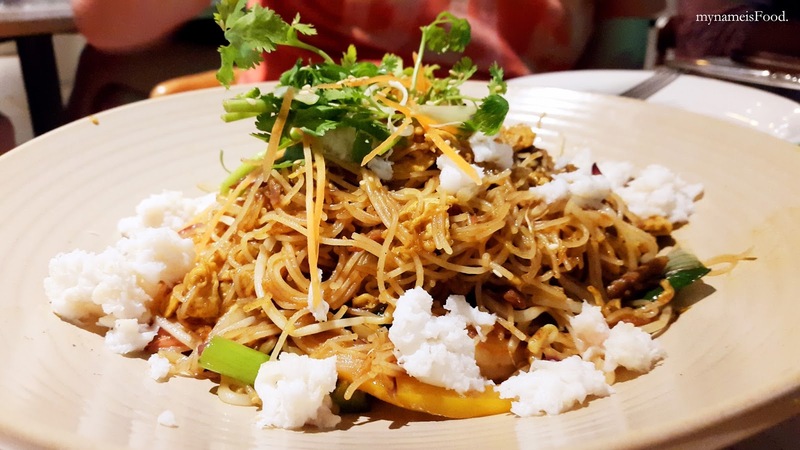 The spanner crab isn't mixed in nor flavoured into the whole dish but instead, they are roughly placed all around the whole dish giving it this nice touch having a bright plumpy white crab meat everywhere. I would have to agree that this would be a better presentation for the crab meat as the crab meat itself is unique and juicy while also very smooth. 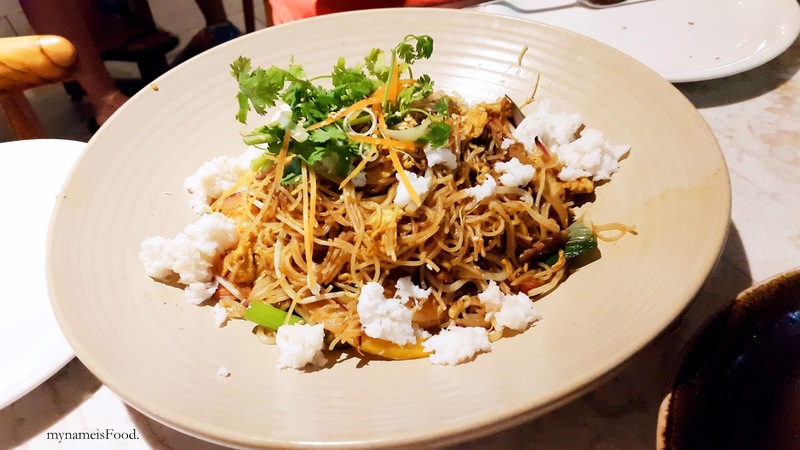 If it was mixed and tossed around in the pan along with the noodles and sauce and so on, the flavour of the crab meat would be spoilt. 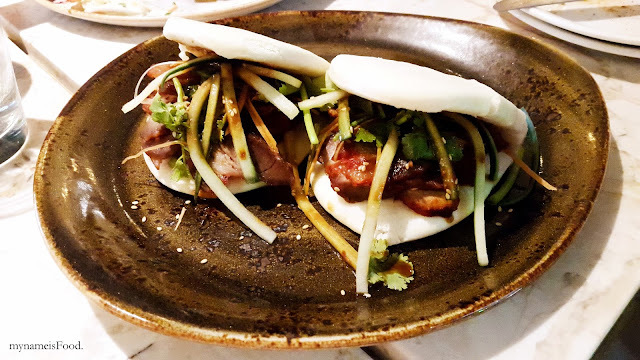 'Peking Duck and Char Siu Pork Steamed Bun Sliders' ($22) were quite cute but messy to eat. Before you do get confused, the meats aren't mixed in together in a bun but are seperately made. So one was the Peking Duck steamed bun and the other, the Char Siu pork. You are able to see that both have had sufficient amounts of the Hoi Sin sauce however, it was rather hard to take a bite of it since it would either fall or the steam bun would break in the middle. 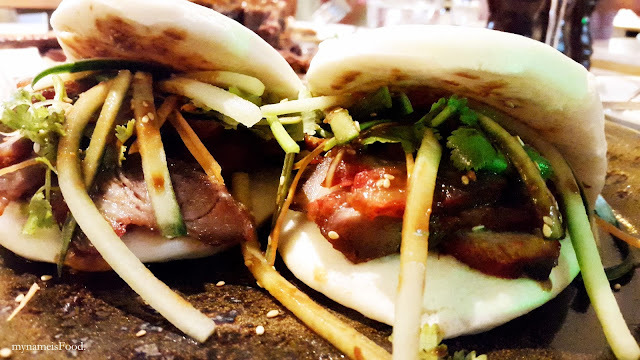 The cucumber strips were coming out of the buns however you are able to see how well they have marinated and sauced the meats as well as the filling. The shallots and coriander made the dish a nice and refreshing dish as it balanced well with the warm duck and char siu.